It’s been an exciting week. Today, I had the temporary cast for my fractured radius removed and a new one put on. It’ll be another five weeks of struggling to do the simplest things, like buttoning my jeans, opening bottles or washing under my right arm with my right hand. The new cast is even more restricting than the old one. Just when I was feeling frustrated because it takes so much longer to write now (no dragging and dropping etc.) I received three pieces of great news in less than 24 hours. First, I found out that Issue 51.2 of PRISM International has just been released. I’m pleased to announce that the title story of my forthcoming book Breakfast Under the Bodhi Tree is among the stories published in this issue, and it’s in fantastic company with stories and poetry by Sarah Selecky, Fiona Tinwei-Lam, Evelyn Lau and others. 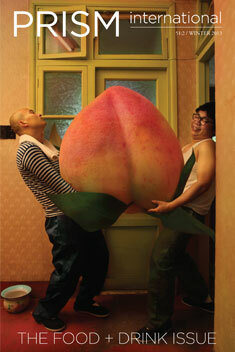 The giant peach on the cover is the work of photographer and artist Maleonn. Prism will also be featuring a number of my photos of my beloved bodhi tree on their website. I then learned that my weird and nondual story Mindswitch has been accepted for publication in Impossible Spaces, a forthcoming British anthology from Hic Dragones. The story had been looking for a home for over two years. Several editors said they enjoyed it but it wasn’t right for the particular issue. A couple said they’d very nearly accepted it. It is a weird story with an even weirder ending. I finally decided to alter the ending in a minor way and submit it again. That’s when I saw a call for submissions that seemed like a perfect match. I almost changed the ending back but decided not to. A good story may have to knock on several doors but eventually, it will find a loving home. Never give up! I was also pleased to learn that a story by Margrét Helgadóttir, a talented fellow writer, will appear in the anthology too. I’m looking forward to receiving my copy of Issue #47. Looks like it’s packed with great writing. 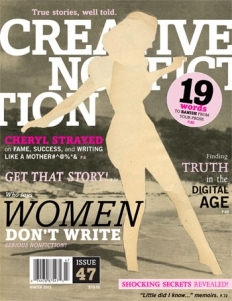 This entry was posted in Breakfast Under the Bodhi Tree, Creative Non-Fiction, News, Photography, Viet Nam and tagged anthology, CNFonline, Hic Dragones, Impossible Spaces, Margret Helgadottir, nonduality, PRISM, weird. Bookmark the permalink. Wow…good for you!! I know it doesn’t make the broken arm any less frustrating, but isn’t it nice to have your hard work validated! So true, Evelyn. Thanks for your support. Oh my goodness. Congratulations is a word that doesn’t quite embrace the fireworks I am shooting through my imaginery sky for you. And to all come at once. It takes all (most) of the pain away doesn’t it? Validation indeed. Kinda makes it all worthwhile. I’ll raise a glass to you tonight. Thanks so much, Susan! I’ll raise a glass for your recent accomplishments too! Success has got to be the best painkiller? 😉 So happy for you! My grandmother always said that when one door closes another opens. Your good fortune seems proof of that. Well done. Yes, there’s that saying and also the one about the silver lining. I’ve been experiencing examples of both in the last few weeks.